KERA’s series One Crisis Away put a face on asset poverty by chronicling four North Texas families dealing with life on the financial edge. This holiday season, we’re catching up with some of those families, including 73-year-old Shirley Martin. Health issues forced her to retire from her career as a cook a decade and a half ago. But she was back working a year later. According to a recent Gallup poll the average U.S. retirement age is 62. Shirley’s not average, she still works five days a week to make ends meet and her dream of a real retirement still isn’t an option. 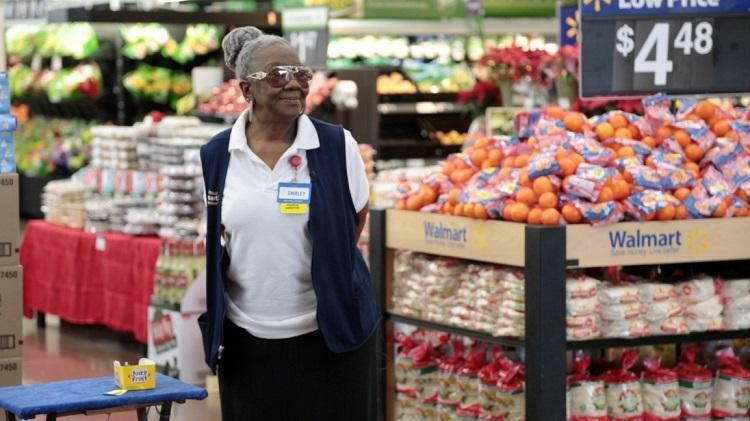 Shirley’s actual job title is “People Greeter” at the Desoto Walmart. For 32 hours each week, she checks shoppers’ receipts, points customers in the right direction and most importantly, offers up a warm, friendly greeting. In about a 15 minute span of greeting customers, Shirley got two hugs, a compliment on her perfume and an update on a recent medical diagnosis. So why do people flock to Shirley Martin? And she goes out of her way to help if she can. Take one customer last month who didn’t have a place to live with her two young grandchildren. They moved in the week before Thanksgiving. When we profiled her a year ago, Shirley was sharing her Desoto home with paying tenants. They’ve all moved out and that’s put her in an even tighter financial spot. “All the bills still go on. They don’t stop, they don’t come down. They go up. It takes every dime I get. Even with my income I have from Social Security and the job that I have here. It takes every bit of it,” she says. Shirley gets $1,200 dollars a month from Social Security, that’s just a little below average. She makes $7.75 an hour at Walmart. That’s less than $13,000 a year. Shirley knows she won’t be able to work in retail forever. She CAN sit on a stool during her shift, but most of the time, she’s on her feet, right in the middle of the chaos. It’s clear that thinking of herself is the last thing on Shirley’s priority list when she’s at work. She treats everyone with the utmost respect. From the customer who’s facing tough times, to the rich and famous. “Who’s that, Nez Bryant? Dez Bryant? Dez Bryant. He was in here a couple weeks ago,” Shirley says.